The landscape in North Dakota is the sky—the stars at night, the clouds in the daytime. At night I thought about the stars and light-years and the speed of light and everything that was sort of inexplicable. With the installation of The North Dakota Mural at Plains Art Museum in 2010, James Rosenquist returned to his home state in a big way. Drawing on his childhood memories of the Great Plains, he created a work that speaks to the wide open spaces, huge vistas, and ocean-like skies of the region. Using his signature style of mixing different images together at varied scales, he invites us to contemplate how nature, society, culture, agriculture, industry, and history relate to each other in this particular place. The heavens of stars, nebulae, and galaxies depicted in the upper half of the painting make us ponder our place in the universe as much as our location on planet Earth. 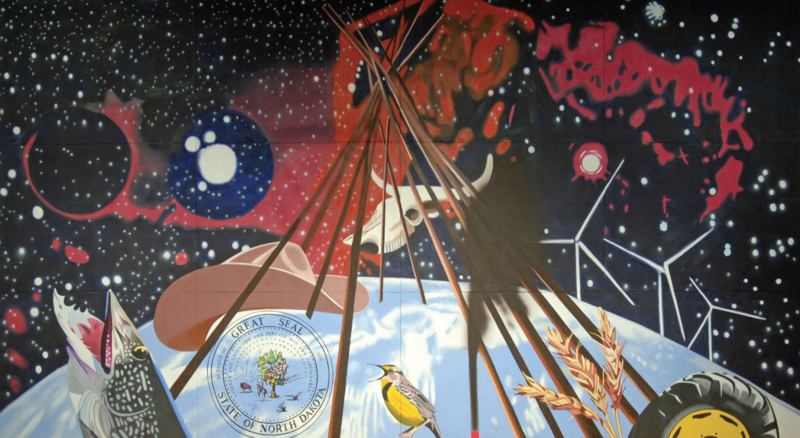 The North Dakota Mural was commissioned by Plains Art Museum as part of a major capital campaign. Many in the local arts community have worked toward this long-standing dream of acquiring a major work by this important artist and local son. Plains Art Museum thanks James Rosenquist for his in-kind donation of creative work and an anonymous donor who supported the commissioning of this artwork. Additional thanks go to the National Endowment for the Arts and an anonymous donor for supporting installation costs. James Rosenquist, The North Dakota Mural, 2010, oil on canvas, 13 x 24 ft., Gift of an Anonymous Donor in honor of Dr. Jovan Brkić, a world-renowned scholar of philosophy, gentleman, and friend; and made possible by an in-kind creative gift by James Rosenquist, © James Rosenquist.